Did you know that over 62% of Australian adults would consider orthodontic treatment to correct crooked and misaligned teeth? 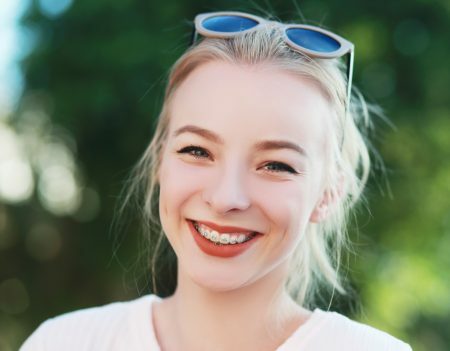 While orthodontics is generally associated with young children and adolescences, they are increasingly offered as a treatment for issues we experience throughout adulthood. Teeth straightening solutions form a vital element of a fully tailored dental health treatment plan. With consideration given to not only the aesthetics but functionality and form as well. Modern orthodontic treatments offer an unobtrusive avenue to a fully functional and aesthetically superior smile that inspires confidence and boosts self-esteem. The more traditional steel brace can be traced back to the late 1920s, while ceramic and porcelain brackets made their debut in the 1970s. Towards the end of the 20th century, the clear aligner surfaced offering a non-invasive solution where once uncomfortable elastics and springs were market leaders. Orthodontic solutions are now minimalistic with a focus on the gentle manipulation of the teeth and jaw in a non-invasive manner. Conventional Braces: featuring a series of individual brackets and arch wires, our traditional steel braces are a proven tooth straightening technique designed to provide a gradual shifting of your teeth into the desired position. Consult with our team to determine the most effective way to straighten your teeth, whether you pursue the more traditional treatment or prefer the transparent, discreet clear aligner. We have a smile solution for you. To discuss your teeth straightening options in detail, call for consultation at Dentistree on (03) 9763 7333 today.